Smokehouse of The Catskills, as we expected, did it again. 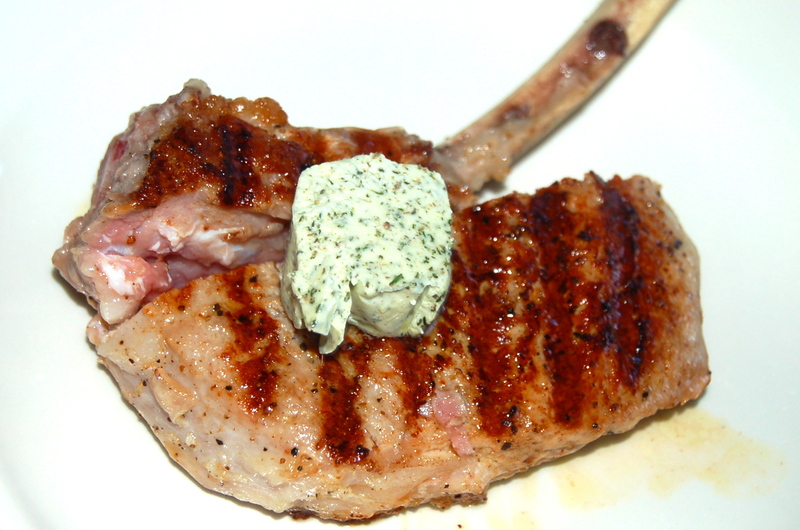 A knife cut through the Veal Chop like it was butter, and topped with a pat of Rosemary Butter, it was a culinary treat. The chop weighed a pound and a half and it amply served the two of us. I pan grilled It on the stove, because it was really too hot to step outside to the BBQ. Accompanied with Cauliflower roasted to a char and Peppers and Anchovies, it was a meal good enough for a dinner party. 1. Whisk Butter, Rosemary, Thyme, & a pinch of Salt in small bowl to blend. Wrap the Butter in plastic wrap, forming 1-1/2 inch diameter log. Chill for at least 2 hours. 1. Liberally sprinkle with Salt & Pepper. Rub 1 TB of EVOO into the Chop. Let stand at room temperature for 1/2 hour before continuing. 2. Heat 1 TB of EVOO in heavy large grill pan over medium-high heat. Add Rosemary Sprig & Garlic. Saute until Garlic is fragrant but not brown, about 2 minutes. Discard Rosemary & Garlic. Increase heat to high. 3. Add the Chop. Cook until it’s browned and meat thermometer inserted horizontally into center reads 120 degrees F, about 2 minutes per side. Transfer the Chop to a cutting board. Allow to rest for 5 minutes. Cut the Chop in half. 4. Place 1 slice of Rosemary Butter atop each piece & serve.